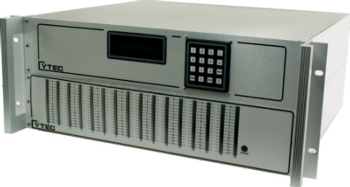 This Chassis controls up to 8 16x1 75 ohm CATV Modules specifically for Cable TV Lab automation. LEDs on the front panel show switch and power status. Add Switch Modules, Driver Modules and a Control Module to complete the system. CXAR Series - Cytec Corp. This series is typically used for frequencies from DC to 1000 MHz. There are a large variety of 1x2, 1x4, 1x8 and some 1x16 modules available. Other specialty modules such as 2 wire balanced line, solid state 75 ohm and extremely low leakage ( less than 50 fempto amps ) modules are available. 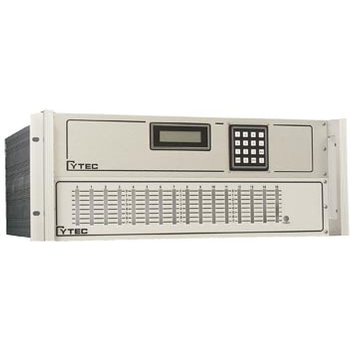 These Chassis controls up to 16 8x1 modules, 32 4x1 modules or any combination or configuration. LEDs on the front panel show switch and power status. Add Switch Modules, Driver Modules and a Control Module to complete the system. These Chassis controls up to 16 4x1 modules, or mixtures of 4x1"s, 2x1"s and 2x2 modules in any combination or configuration. LEDs on the front panel show switch and power status. Add Switch Modules, Driver Modules and a Control Module to complete the system. These Chassis controls up to 4 8x1 modules, 8 4x1 modules or mixtures of 8x1"s, 4x1"s, 2x1"s and 2x2 modules in any combination or configuration. LEDs on the front panel show switch and power status. Add Switch Modules and a Control Module to complete the system. A pushbutton manual control is optional. These Chassis controls up to 2 8x1 modules, 4 4x1 modules or mixtures of 8x1"s, 4x1"s, 2x1"s and 2x2 modules in any combination or configuration. LEDs on the front panel show switch and power status. Add Switch Modules and a Control Module to complete the system. Pushbutton Manual control is optional. CXG DC to 2 GHz - Cytec Corp. 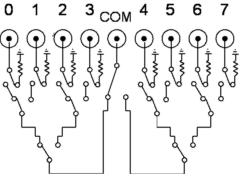 These switch modules use RF relays in a stubless tree switch configuration to provide 50 or 75 ohm impedance modules. 50 ohm modules are available with SMA or BNC connectors. 75 ohm modules are available with BNC or F connectors ( some modules). These switch modules use high reliability reed relays for applications below 150 MHz. Fast, inexpensive reed relays are perfect for coaxial switching at lower frequencies. Switch times of 1 ms and life expectancy of 100 million operations. BNC connectors. CXS 75 ohm CATV - Cytec Corp. These switch modules use high reliability solid state switches for 75 ohm applications between 1 and 1000 MHz ( typical cable TV). Fast, inexpensive solid state relays are perfect for coaxial switching at CATV frequencies. Switch times of 1 ms and life expectancy of 100 billion operations. Terminated to 75 ohms in both directions for use with splitters in either direction. These switch modules use reed relays with extremely low leakage to ground and across contacts for applications where you need to measure extremely high resistance, or extremely low leakage currents. Can be built with driven guards and triax connectors for fast low leakage measurements and ultra low noise levels.